Clark is an acoustic act which sways between hum-able lush harmonies and intimate, poetic melodies. “Gabriel Clark Friley and Dana Friley reside in the central coast of California. 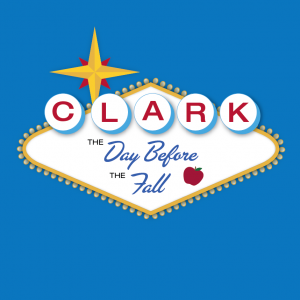 For this July release of Clark’s sophomore album, “The Day Before The Fall”, the dynamic vocal duo put their heads together to evoke a sunny California summer. While the first Clark album, “Here Comes Tomorrow” is the perfect lullaby-for-adults record of gentle finger picking acoustic guitars and Gabriel’s lush vocal melodies, Clark’s timeless Americana initiative in this celebratory release marries vocal harmonies reminiscent of Simon and Garfunkel and the tremolo electric guitarsof 60’s surf rock. Gabriel and Dana channel their love of classic sounds found in The Beatles, The Beach Boys and The Mamas & The Papas, while maintaining their folk familiarity. For this project Clark enlists Tad Wagner (Buellton / Hughes & Wagner), Andy White (Good Times Recording), and Johnny, Johnny Lane (The Dean Martin Show / Follow Me Boys / Carol Channing).” SB County band – Acoustic / Folk / Healing & EasyListening.